The safety of ingesting extremely large amounts of RNA has been studied. No adverse effects were noted from the use of 2 grams of RNA (Hess) to a maximum of 4 grams eaten daily in adults (Rudolph, 1990). In addition nutritional support with 1.3 grams per liter of RNA in elderly individuals resulted in positive effects on immunity. Numerous studies indicate the positive impact of nucleotide/RNA supplementation for infants (Gutierrez-Castrellon 2007). A range of baby formulas in the US as well as Europe include nucleotides and there are several pending petitions to actually mandate the inclusion of nucleotides in all baby formulas. Currently it is recommended that infant formula include 5mg of nucleotides per 100kcal and recognizes that particular specific ratios of nucleotides may have unique benefits (Koletzko 2005). A hundred fold range of concentrations of nucleotides were studied in animal models to assess the impact of nucleotide dose on growth and development. Although all doses were found to be safe, even the lowest dose of nucleotides (.01%) had positive effects on weight gain and food utllization. “Overall, it was demonstrated that NT(nucleotide) supplements could promote the early growth and development at a 0.01% dose. Although NTs may have cumulative reproductive effects, they were safe even at a high-dose supplementation.” (Xu 2013). In addition, to date no side effects have been shown for nucleotides in clinical trials. (Lerner, 2000). Liver, tripe, heart and oofal (a mixture of organ meats from animals) are the most abundant sources of nucleotides, while popular in the past, these foods are lacking in todays’ diet. In spite of dietary changes which have all but eliminated these foods from the diet, individuals still often ingest 1 to 2 grams of nucleotides per day (Hess). Thus it might seem surprising that additional nucleotide support is needed. Consider however, that the daily requirements for nucleotides are estimated to be 450 to 700mg/day in adults, and that level of support is in the absence of added stress, injury, excess exercise or infection or immunological demands (Rudolph, 1990). 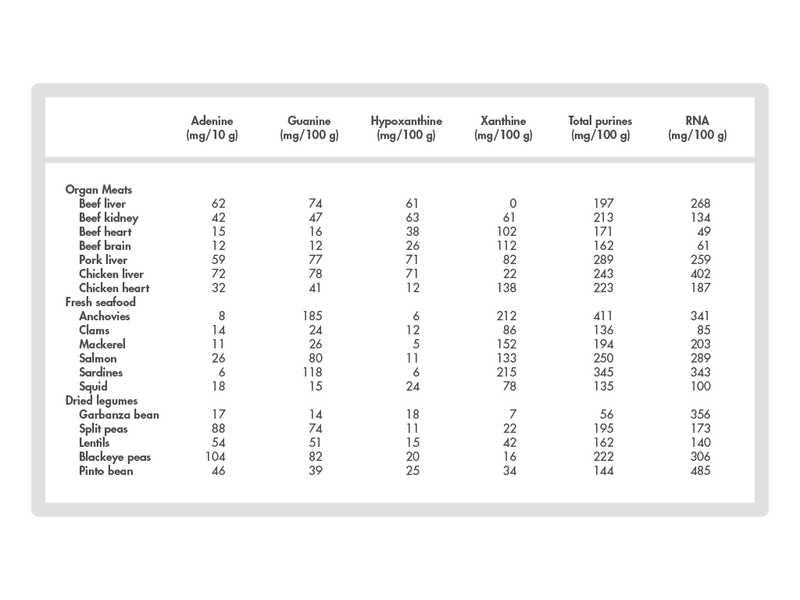 While in the past, organ meats with a total RNA content as high as 400 mg/gm may have helped meet these demands, levels of only 80 for seafood and 140 to 190 for legumes help create the need for additional nucleotide support. 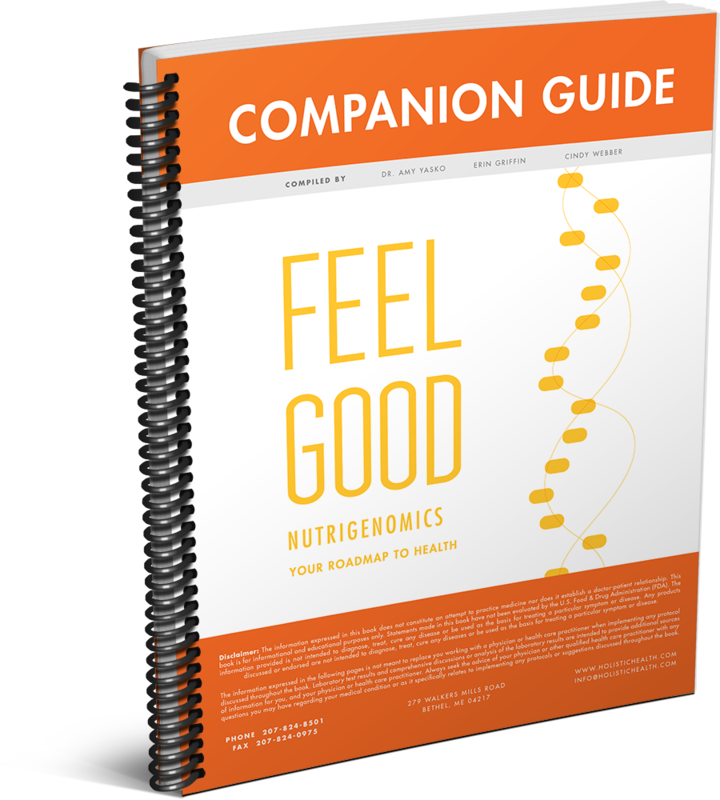 Stress, infection, lack of sleep, exercise all put added burdens on the need for nucleotide support in adults, and numerous studies suggest that nucleotides need to be added to infant formula. In fact petitions have been submitted to the government suggesting that nucleotides be required in these formulas. The FDA has allowed infant formulas to be supplemented with nucleotides since the 1990’s and nucleotides extracted from yeast RNA are now included in baby formula as organic ingredients. In addition the European Union Infant Formula Directive does not require but has approved the addition of specific nucleotide blends for nutritional use. The FDA’s position is that “nucleic acids are large molecules that are encoded with genetic instructions and are part of each living cell. Nucleic acids taken orally are not effective and have no impact, as they are changed or destroyed in the intestinal tract before they can be absorbed. 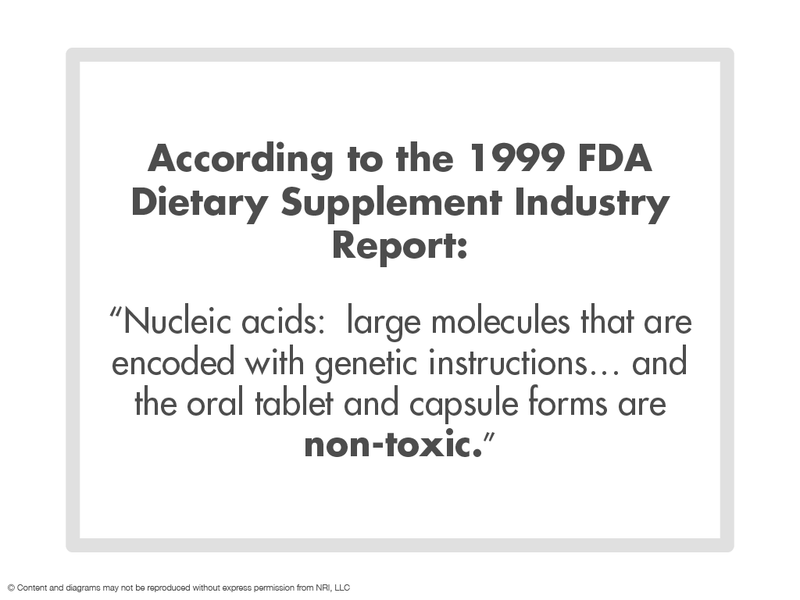 There is no deficiency for nucleic acids and the oral tablet and capsule forms are non toxic” (FDA Food Safety and Applied Nutrition, March 1999, FDA Economic Characterization of the Dietary Supplement Industry Final Report, Section 4.1.8). The FDA “only weighs in on the safety and efficacy…not the mechanism by which it works” (Smaglik, P. Scientist, Aug, 1998). 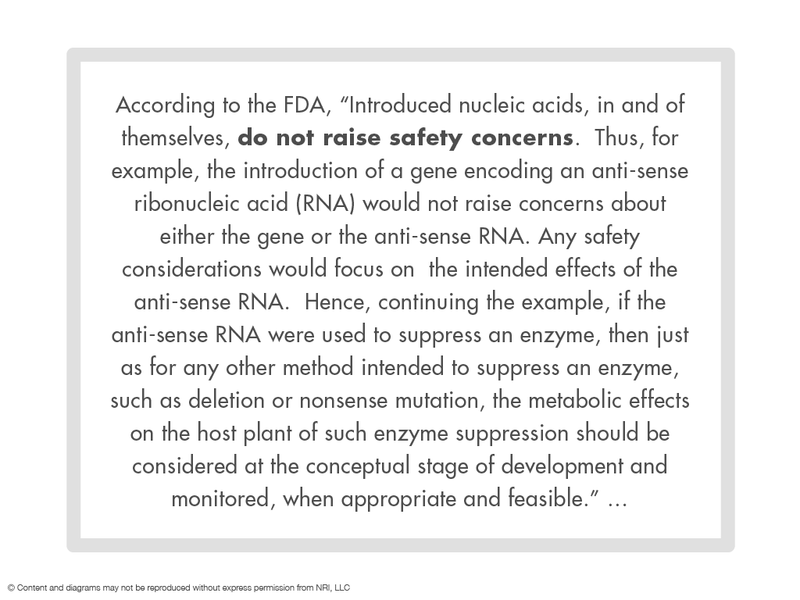 This is consistent with the fact that the FDA seems satisfied with the safety of natural RNAs, regardless of their mechanism of action, presumably due to the fact that they break down in the body and are ingested in large doses as a food on a regular basis. 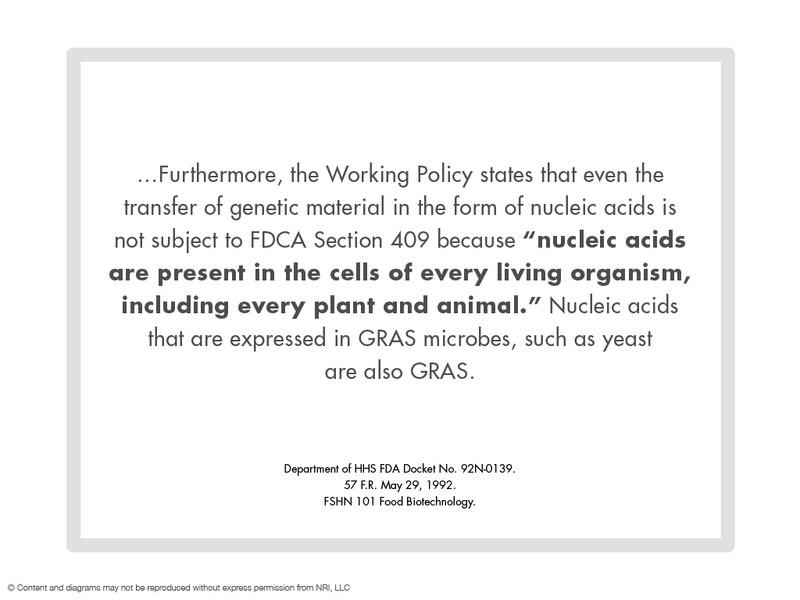 “Introduced nucleic acids, in and of themselves, do not raise safety concerns.” (Department of Health and Human Services Food and Drug Administration Docket No. 92N-0139). Furthermore, the Working Policy (57 F.R. May 29, 1992) states that even the transfer of genetic material in the form of nucleic acids is not subject to FDCA Section 409 because “nucleic acids are present in the cells of every living organism, including every plant and animal”. Nucleic acids that are expressed in GRAS microbes, such as yeast are also GRAS (FSHN 101 Food Biotechnology). The fact that the RNA bases are found in breast milk, are added to baby formula, and are beneficial to the very sickest individuals in ICUs and those undergoing surgery, underscores the safety of these natural RNAs. The actual backbone of the RNA is released along with the nucleotides when the RNA is digested in the body. This ribose sugar also has beneficial effects in the body. The greatest amount of literature supporting the use of ribose has concentrated on its advantages for the heart. In multiple studies ribose has been found to improve heart function, particularly in cases of congestive heart failure (Omran, H. Euro. J. Heart Failure, Oct, 2003). Ribose has also been used extensively to aid in energy production in the body. Ribose is used to supplement high energy requiring activities including high intensity exercise. Ribose itself has received a GRAS status. The ingestion of substances normally found in food and eaten on a regular basis are considered to be safe by the FDA. “[foods that] do not contain substances that are significantly different from those already in the diet and thus do not require pre-market approval” (Center for Food Safety and Applied Nutrition).